1. These athletes volleyed for women’s rights in Afghanistan. 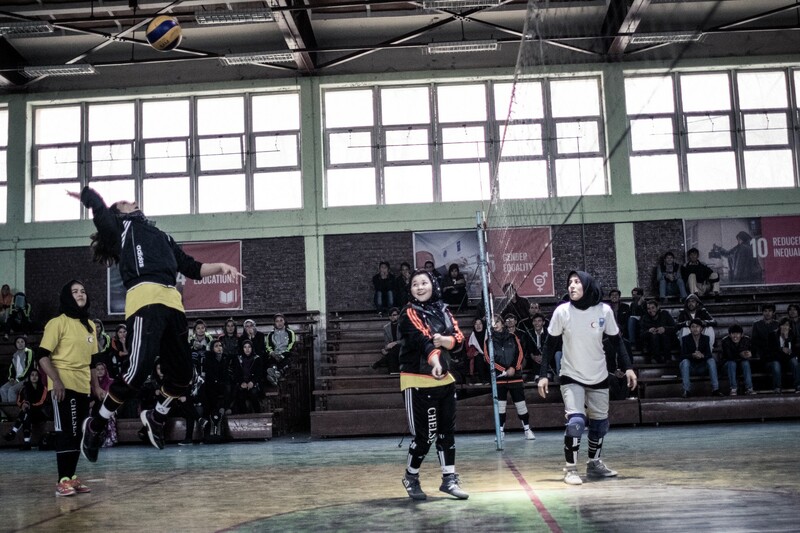 In 2016, UNDP Afghanistan and the Afghan Red Crescent hosted a women’s volleyball game at Kabul University for the 16 Days of Activism to End Violence Against Women. They are one of the first young women in the nation to attend university and play sports since the Taliban regime ended in Afghanistan in 2001. According to data from the World Bank, net enrollment at the end of the Taliban regime was 43 percent for boys but only three percent for girls. Since 2002, school enrollment has skyrocketed, boosting the number of girls in secondary education from 3% to 36%, but young women’s access to higher education remains a challenge. 2. 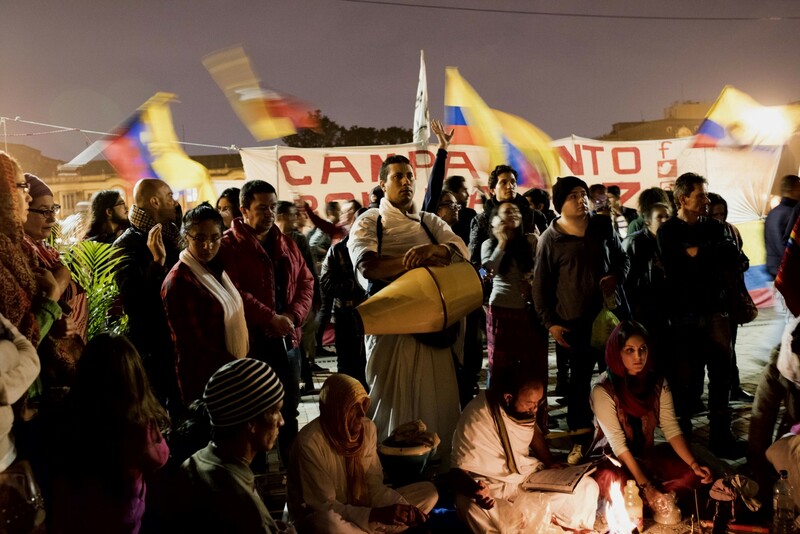 Many took to the streets to celebrate Colombia’s historic peace deal. Some sealed it with a kiss. In November, Colombians and the world watched as the government of Colombia and The Revolutionary Armed Forces of Colombia reached a final Peace Accord. Five decades of war have displaced 6.27 million Colombians — 13% of the country’s population. This deal heralds hope for Colombians who have lived through 51 years of nonstop war. Over 220,000 people have died in the war, of this, 81% were civilian casualties. UNDP has trained civil society and rights’ groups to have a voice at the negotiation table to end war. At least 22,000 internally displaced Colombians have rebuilt lives through our joint project with UN Refugee Agency which provided access to housing, public services such as healthcare and legal aid, vocational trainings and micro-loans to rebuild family businesses. 3. Ecuador rises from the rubble of an earthquake. On April 16, a 7.8 magnitude earthquake struck northwest Ecuador. At least 673 people were killed and 16,600 people were injured. Since the onset of the earthquake, UNDP has been working with the government of Ecuador and communities on disaster preparedness and earthquake recovery. After crisis strikes, such as earthquakes, we put communities to work to move storm debris and rubble to clear roads for emergency vehicles; train people to rebuild homes which can withstand future earthquakes; and to restore essential services such as water purification and power grids. So far, 490 emergency workers through our cash-for-work programme have removed 20,000 square meters of rubble. 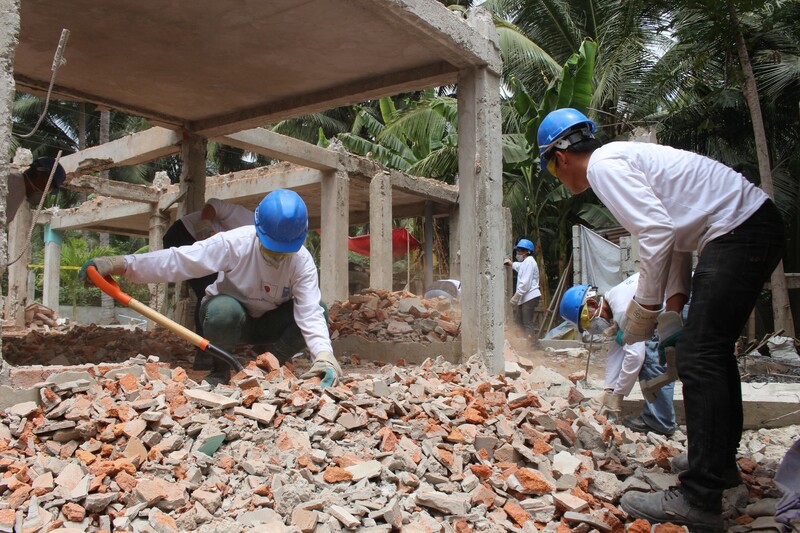 Five hundred homeowners completed earthquake-resistant construction training to rebuild after the earthquake. 4. The Maldives fight for survival against a goliath, the wide open ocean. The Maldives is one of the many island nations facing extinction if sea levels continue to rise. At its highest point, the Maldives sit eight feet above sea level. Most of its land is three feet above sea level. UNDP works with nations on the frontlines of climate change to protect agriculture, livelihoods and tackle extreme poverty. We work with Maldivians to slow down soil erosion and salinity of freshwater and soil. Maldivians harvest freshwater from rain, grow mangrove trees, restore coral nurseries, and address human behaviors like pollution and overfishing. The Maldives lost 60% of its coral reefs to a global coral bleaching phenomenon in 2016. Healthy coral reef systems are vital for Maldivians whose livelihoods and food come from fishing. Saving the Maldives and other coastal communities facing similar challenges of survival will require global action to slow down rising global temperatures. A historic United Nations climate agreement aims to keep average global temperatures from rising more than two degrees Celsius to sustain life on earth. 5. Hurricane Matthew wrecks havoc in Haiti. 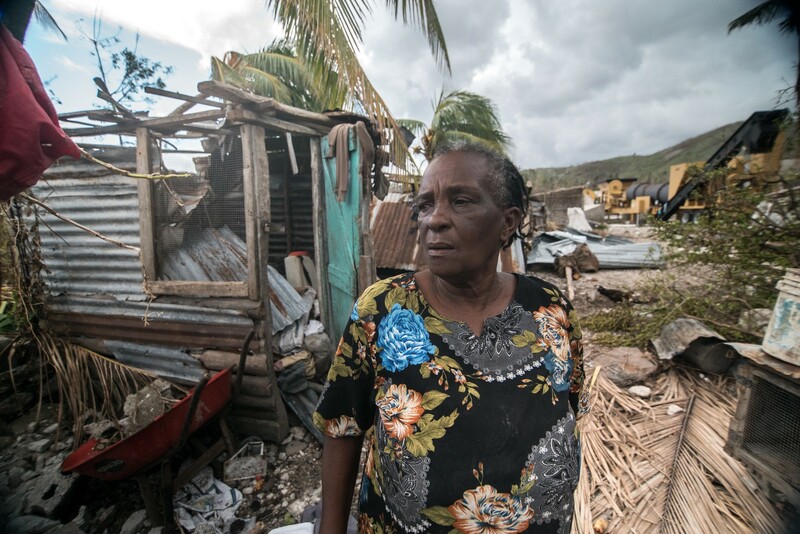 “My house is destroyed,” says 66-year-old grandmother Abellard Raymond, one of the millions of Haitians who lost everything after Hurricane Matthew. The category 4 storm pummeled southern Haiti, a key region of agriculture and food for Haitians still recovering from a lethal earthquake in 2010. By mid-December, through our emergency employment projects, we were able to provide 23,680 daily jobs in 10 of the most affected areas in Haiti. The workers have cleaned 19,200 meters of irrigation canal to ensure the flow of clean water and curb the spread of water-borne diseases. Storm debris has been cleared from 3,600 meters of road, and workers have collected 40,800 square meters of garbage and debris. 6. 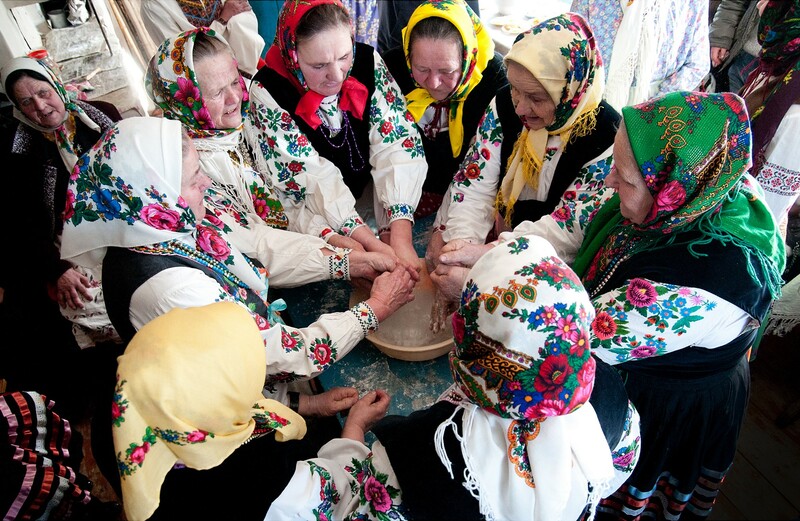 Drastic weather is affecting Moldova’s agricultural sector. Droughts have become more severe in the past 20 years. From Mali to this farmland in Moldova, climate change threatens Earth’s food supply and health. Worldwide 500 million family farms produce more than 80% of Earth’s food, according to the our 2015 Human Development Report. Nearly a billion people work in agriculture. Protecting food supplies and agricultural sector requires partnerships. Countries such as Moldova are members of Meteoalarm, a unique initiative by EUMETNET, the Network of European Meteorological Services which is active in 35 countries in Europe and strongly supported by the World Meteorological Organization. Meteoalarm is one way we team up with networks of partners and donors for a coordinated response to climate adaptation and disaster risk reduction in the region. 7. Mongolia’s legendary horsemen race to stop the encroaching sands. In the past 30 years, nearly a quarter of the land in Mongolia has turned to desert and thousands of lakes and rivers have dried out. Mongolians, nomadic for centuries, are working with our climate adaptation teams to save precious pasture land from encroaching sands. 8. This valley in the Himalayas used to have ice glaciers and snow. 2016 was earth’s warmest year on record. This Nepali valley in the Himalayas used to be filled with ice and snow. The emergence of diseases such as Dengue fever at the roof of the world is a new phenomenon. Changes in disease patterns and a spike in pests which carry infectious disease herald dangerous signs of a changing climate. Many nations’ health systems and budgets, including those of Nepal’s, face new health crises and pandemic risks. 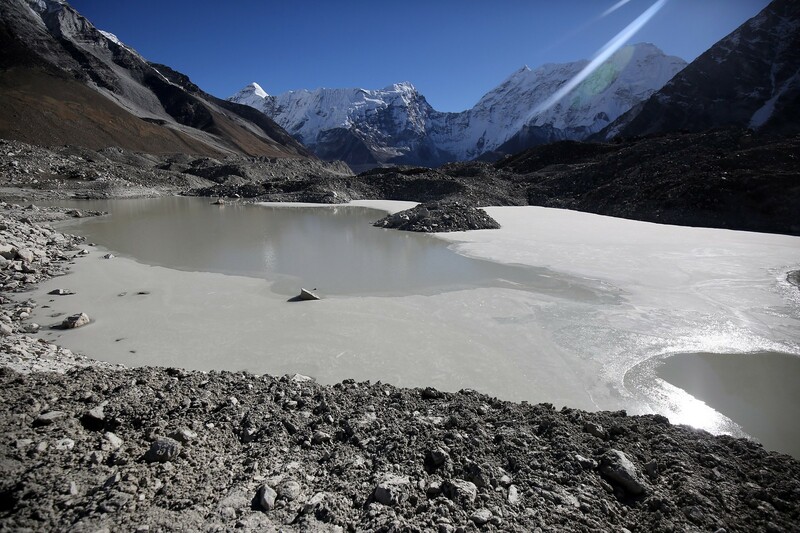 We’ve been working with Himalayan communities on disaster preparedness projects to save lives and businesses during glacial lake outburst floods (GOLF), help farmers and governments’ policy makers to adapt local and national development plans in response to changes in the weather like droughts, water shortages and lethal floods. 9. Nigeria moves to restore rule of law as extremist group Boko Haram continues to disrupt peace and stability. The conflict in northeast Nigeria, fueled by extremist group Boko Haram, has led to widespread devastation. Since Boko Haram’s rise in 2009, more than 20,000 people have been killed. Women and girls continue to be abducted while the group continues to draft children as suicide bombers. Up to 2.1 million people fled their homes at the height of the conflict, 1.8 million of whom are currently internally displaced and 200,000 have become refugees in the neighbouring countries of Cameroon, Chad and Niger. 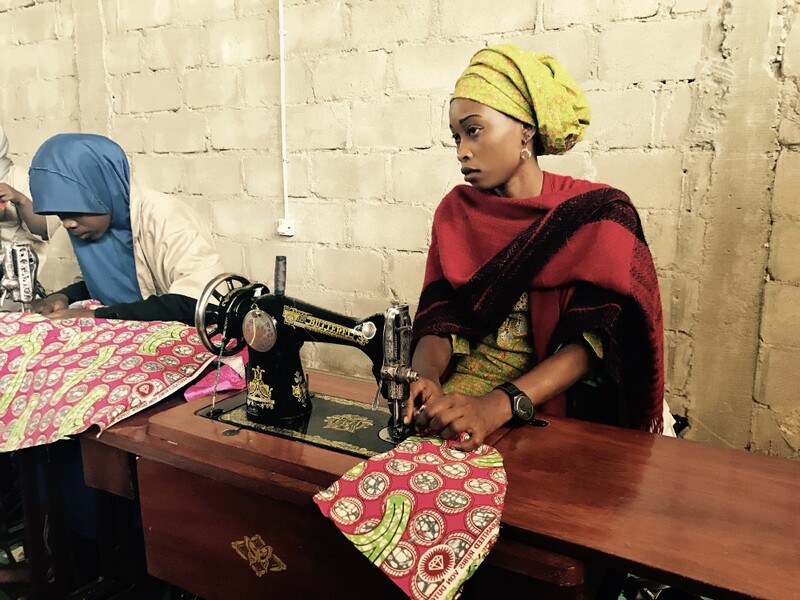 In 2016, our primary goal in Nigeria was to help displaced families who needed work, homes, and essentials after escaping Boko Haram-held territories. We also helped host communities in Nigeria take in those who have fled violence. 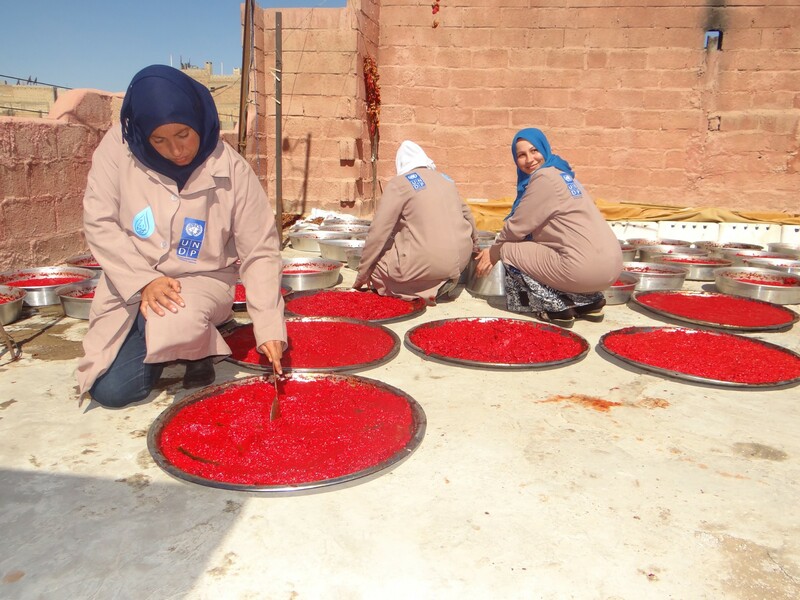 The heart of our work is to provide trainings and creating jobs for affected communities to build peace. Through our emergency projects, communities construct new housing; restore law and order for community safety; build irrigation systems for farms drinking water; and restore energy and sanitation systems. 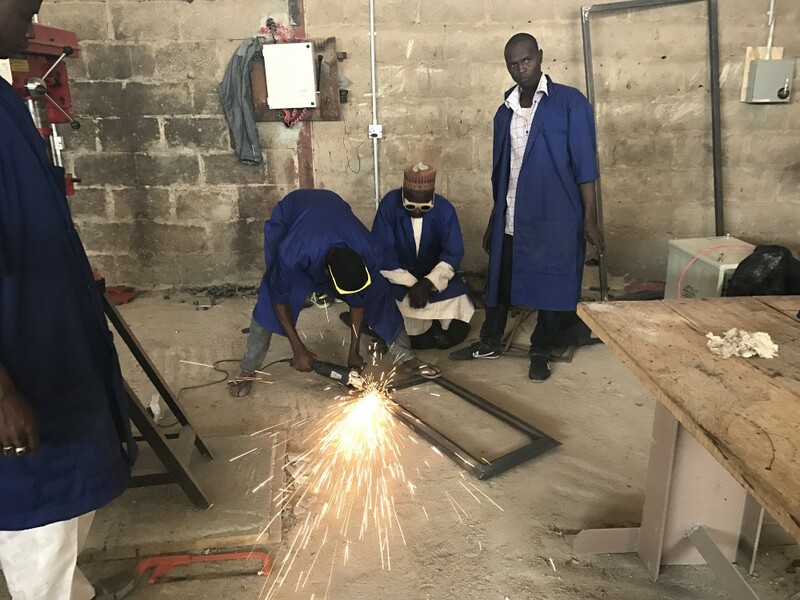 The Maiduguri Life Skill Center was founded by UNDP in collaboration with the Nigerian Ministry for Reconstruction, Rehabilitation and Resettlement and the support of the Government of Japan. Each month, the center trains 200 Nigerians who have been internally displaced by violent fighting. They will use the vocational skills they learned to rebuild their country. 10. These two athletes from Syria and South Sudan made history for refugees at the Summer Olympics in 2016. 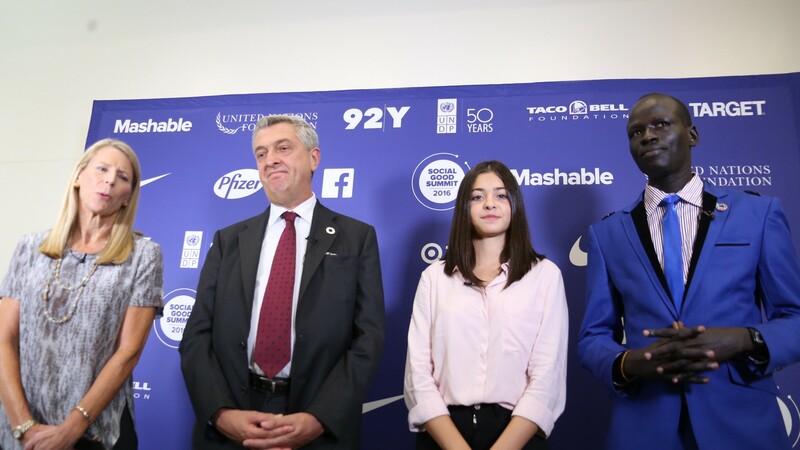 Pictured at the 2016 Social Good Summit, Yusra Mardini (pictured second from right) is an 18-year-old Olympian swimmer and Yiech Pur Biel (pictured at right) is a 21-year-old track and field Olympian who competed in the Rio 2016 Summer Olympics with Team Refugees. Olympian Yusra and her sister swam for three-hours when the rubber dinghy they were in with fellow Syrian refugees began to sink in the middle of the Aegean Sea as the group was fleeing war in Syria for refuge in Lesbos, Greece. They saved 20 lives that day. Yiech Pur Biel was only 10 years old when his mom left him and four siblings at an orphanage in South Sudan to find work in Ethiopia. At 11, Yusra fled South Sudan to live in Kakuma Refugee Camp for the next 10 years of his life as a refugee in Kenya. From morning to nightfall, he ran, without shoes, without adequate access to water or sanitation, he ran all the way to the Olympics team. 11. South Sudan, the world’s youngest nation, caught in war, continues to work to restore law and order. 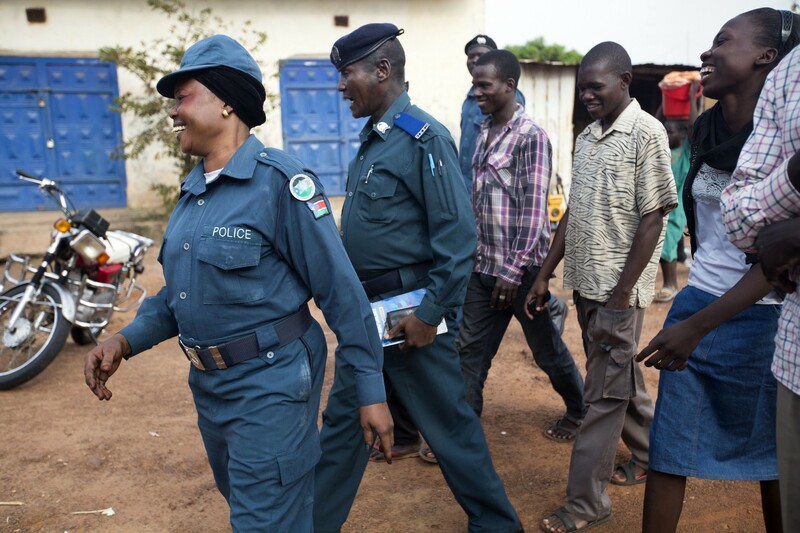 Police officers and young community policing volunteers based in Jebel Ker, in Wau, South Sudan, patrol the market area. South Sudan is the world’s youngest nation which is currently in an ongoing civil war. Lawlessness has led to high rates of crime in towns like Jebel Ker. UNDP has been working to restore rule of law by training police and community volunteers who work together. Daily evening patrols and police presence bring a sense of safety in neighborhoods as people close up shops, finish work and head home. 12. The war in Syria is almost in its sixth year. In 2016, the war in Syria reached its fifth year. According to United Nations OCHA, 13.5 million people currently require humanitarian assistance in Syria. More than 4.8 million Syrian refugees are in just five countries — Turkey, Lebanon, Jordan, Iraq and Egypt. UN Refugee Agency reports that the number of displaced people worldwide is at its highest ever since the end of World War II — Syrians make up a huge proportion of people who have lost their homes to war. We work with affected Syrians to maintain the basic building blocks they need to survive such as food, water, shelter, work, healthcare, warmth, and sanitation. Since the start of the war, we have been creating work for heads of households, many of whom are women and people living with disabilities working outside their homes for the first time in their lives and transforming gender and cultural roles. In 2016 alone, three thousand persons living with disabilities received prosthetic limbs, physical therapy, psycho-social services and vocational training in our physical rehabilitation health centers. Twenty-seven thousand women found work through our job training programs for small businesses which provide food and clothes to communities. Workers in our cash-for-work project cleared 236,000 tons of bomb debris and cleared roads. 13. The conflict in eastern Ukraine is now in its fourth year. On 21 November 2013, conflict erupted in eastern Ukraine. According to United Nations OCHA, 3.8 million civilians are in need of humanitarian assistance in the Ukraine. There were 300,000 internally displaced persons in Ukranian government-controlled areas. As more families flee the frontlines and take refuge in host communities further west in the Ukraine; public services such as water, sanitation, education, health and energy systems, and jobs have become scarce. Our employment program provides both host communities and displaced people new work skills to rebuild and maintain essential services. 14. Women’s roles transform due to the war in Yemen. When the civil war exploded in March 2015 in Yemen, water, fuel and electricity were the first to go in highly populated cities like Sana’a and Aden, which became active battlegrounds for urban warfare. Then food prices began to soar as blockades took effect, cutting off food supplies. Even before the war, Yemen was one of the poorest countries in the Middle East. Ninety percent of its food, including grains for bread, a Yemeni staple, had come from abroad. Since the beginning of the war, we’ve focused on creating livelihoods for heads of households to address hunger and health. Debris removal, road work and mechanical and electrical repair jobs meet demands for health and sanitation, clean water, and energy. With the government of Japan, we worked with rural farmers outside of battle zones, especially women-led farms and maintained food supplies such as vegetables and cheese. Our emergency employment workers cleared roads and repaired supply trucks, and ensured food reached the most affected civilians. Before the war, Yemen had one of the highest maternal mortality rates in the region. As health systems collapsed, we trained midwives in hard-to-access rural regions, who provided prenatal healthcare to pregnant women.